Edibles make up a huge category of cannabis products. We have come a long way since Brownie Mary made the cannabis brownie famous. Now, pretty much any food you can think of can be infused with cannabis. In the old days, any cannabis cookie was great simply because it had THC in it. But today we have so many choices in cannabis edibles that the food itself needs to be enjoyable, too. And this is why we were so delighted to sample the cannabis-infused chocolate truffles from Emerald Organics. 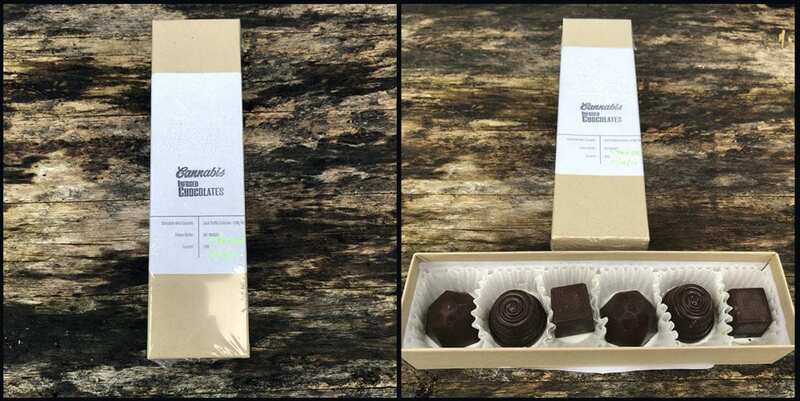 Efficient, tasteful packaging of the Emerald Organics chocolate truffles. Even as I write this I am beginning to salivate remembering how enjoyable the tasting session for this review was. The retail package we received contained six chocolates, two each filled with peanut butter, ganache or caramel. Each truffle has a dark chocolate exterior shell and contains 8mg of THC. Some in the review group wished that we also had a separate unmedicated box because they felt comfortable sticking with the 8mg THC dose, yet their mouth wanted to eat the entire box. This is a common problem with exceptional cannabis edibles — they are so good that you’d eat them even if they didn’t have cannabis in them. Dan Kulchin and Jen Aspuria produce these fine chocolates with cannabis grown organically and in living soil on their permitted (less than 10,000 sq ft) farm in Briceland, California — right in the heart of southern Humboldt County. They also run the cannabis-themed Emerald Camp Resort, an experience we are hoping to review this summer. Dan and Jen control the entire process of making the truffles from growing the cannabis, putting it through their short path distillation, to the actual making of the chocolates. Many edibles companies just buy their cannabis oil inputs from others and thus have a bit less control of the final product. This control allows Emerald Organics to work more efficiently and keep costs down, and it rewards them with a very consistent and high-quality final product. Since California is in market transition, you’ll want to visit the Emerald Organics website to confirm which retailers are selling their truffles. But for now, we know you can pick them up at Wonderland Nursery in Garberville, CA and directly from Emerald Organics by dropping them an email.